The WCM series refrigerated cold pan eliminates the mess and expense of ice in your cold food displays. The drop-in pan can be installed in virtually any counter and is fully self-contained - just plug it in and turn it on. The compressor can also be installed remotely where there's a need to locate it in a different location. The pan is fully insulated for maximum efficiency and energy savings. It is provided with a factory applied gasket so that it can be installed in the finest wood fixtures without marring the counter top. 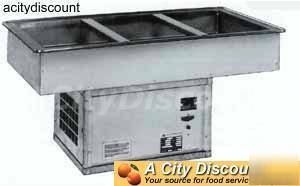 The pan is constructed of stainless steel and has a 3/4" stainless steel drain. The cold pan accomidates standard 12"W X 20" pans, perfect for any cold food serving application. These units have not been performance tested for use with potentially hazardous foods, and must be used with ice. * Utilizes standard 12" X 20" pans, or fractions size pans with the use of adaptor bars. Please note that these units have not been performance tested for use with potentially hazardous food, and must be used with ICE! The flange measures 24"W X 84 3/4"D and has a pan opening of 22 1/4"W X 83".